← Here’s wishing you a fun filled Christmas with some Gingerbread men and women! 2013 is here. Everybody has hopes and aspirations for the future. I pray all your dreams come true! Personally I feel,this is the year of being content. Being happy with what God has given and being satisfied with our achievements. It may not be great in the eyes of others but we all have our own battles to win..our own little mountains to climb. A lot of exciting things are coming my way this year. A new store in india, new projects around the city to name a few. Most importantly, Aaira turns one in May. Seems unbelievable! She completes us as a family. This reminds me-though I barely ever mention Mr Z in my blog, he’s my biggest critique! He’s the best thing thats happened in my life. And to think that we being together at one point wouldve been one the strangest things that could ever be! Which brings me today’s recipe. I’m typing this post using my samsung note and have taken pics using the phone camera. Do let me know what you think. The phone is a gift from the mister, and as always I forced him to buy one himself! He’s settled in for the S3. We dine out once or twice a week, and try to uncover a few hidden gems.predominantly flavours from asia. In one such adventure, we ventured into golconda paradise-a hyderabadi restaurant. The menu there had the usual suspects – biriyani, haleem, kebabs etc. 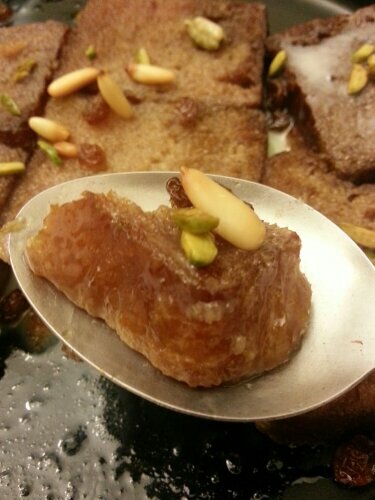 But what caught Mr Z’s eye was the dessert Double ka meetha. I must admit I have not heard of this delicacy ever. 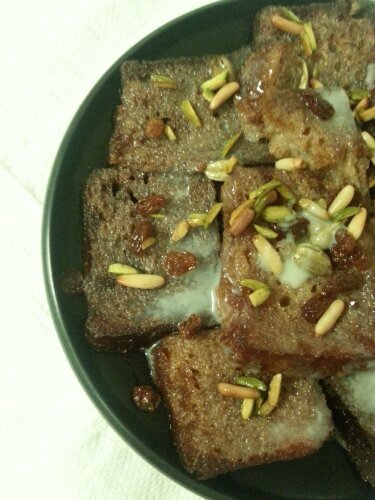 He explained and it seemed like a indianised bread pudding or umm ali. When the dish arrived, it looked mediocre but strangely had the taste of gulab jamun. This is when he promised me that he would make amma’s version. This is one of the easiest desserts to cook. So here goes. In a thick bottom pan dissolve water, sugar with cardamom and bring to a boil. Reduce flame and wait till mixture thickens to form syrup. Let it cool. In a separate pan fry the rusks in oil. Place the fried rusks into the sugar syrup. Please note that the syrup must not be too hot. 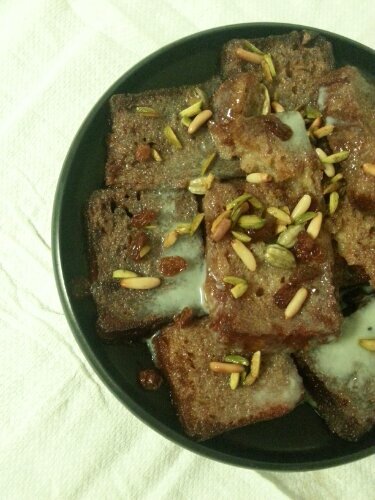 Garnish this with pistachios, raisins and pinenuts. Hmmm very tempting rich dessert. 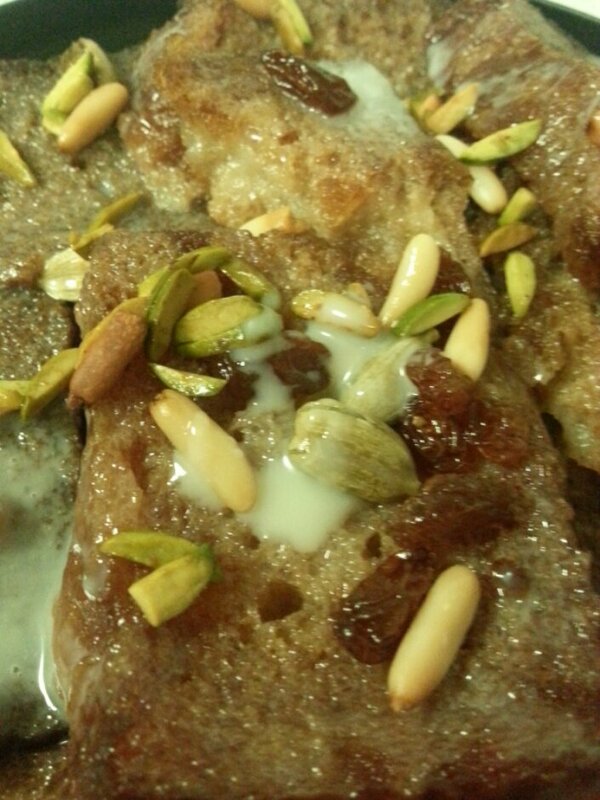 In Pakistan as well as North India, we call this “Shahi Tukrey”. In Hyderabad, this is a must in all wedding feasts! It looks yummy but i wonder at the huge bulk of calories in it. 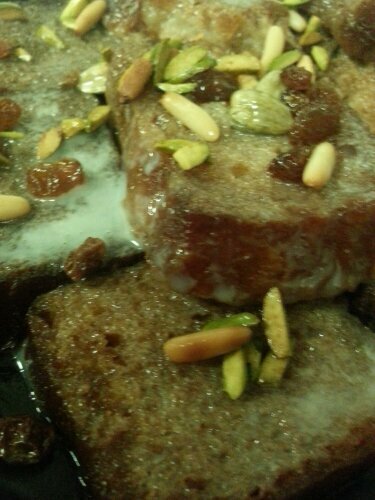 Shahi Tukrey in India..nice pictures, amazing dessert.